With experience dating back to 1984, RMB Group has earned a reputation for dynamic, low cost, fixed-risk option strategies in Stock Indexes, Interest Rates, Precious Metals, Energy, Currencies and Global Ag Markets. Bob, Steve and I encourage you to explore our tailored and personalized account management services. See how our collective experience and dedication to customer service can help maximize the performance of your portfolio. 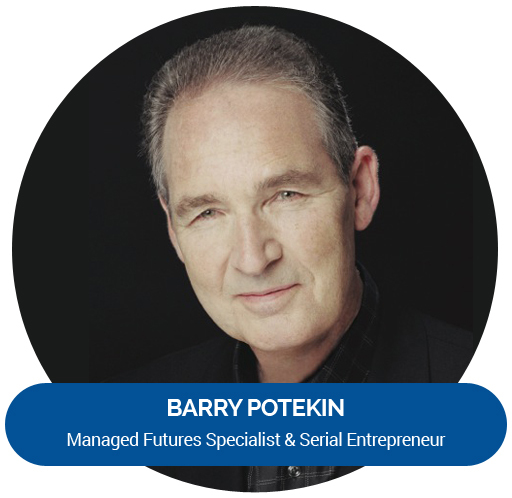 Barry Potekin will be speaking at the Total Wealth Symposium at Omni Amelia Island Plantation Resort, Fernandina Beach, Florida September 12th through September 14th, 2019. Barry Potekin will be speaking at the Irrational Economic Summit at Gaylord National Conference Center, Washington DC October 10th through October 12th, 2019. Managed futures are specifically designed to capitalize on both up and down markets, making them an attractive complement to a traditional portfolio composed of stocks and bonds. Actionable futures and options market insight prepared by RMB Group professionals.